Part Used & Method for Pharmaceutical Preparations: The roots are dug in spring or winter. The spring roots have a stronger pharmacological effect than winter roots. After cleaning, the roots are dried in the sun. Properties & Taste: Sweet, bitter and warm. 1. Hemorrhage in the interior or at the surface of the body. The powder of Notoginseng (Sanqi) is taken alone, or it may be used with Ophicalcite (Huaruishi) and Carbonized human hair (Xueyutan) in the formula Huaxue Dan. 2. Hemorrhages and swelling due to external injuries. 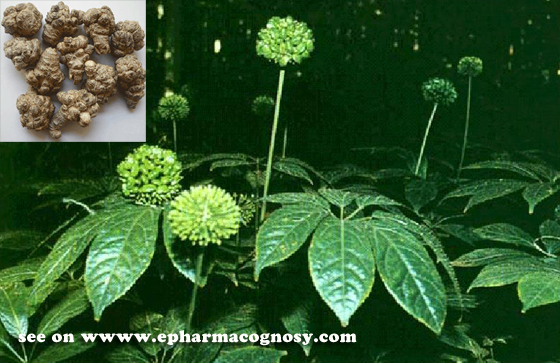 Powdered Notoginseng (Sanqi) is used alone externally. 3. For various kinds of bleeding due to Blood Stasis, it is ground into a powder and taken alone, or with Ophicalcitum (Hua Rui Shi) and Crinis Carbonisatus Hominis (Xue Yu Tan). 4. For bleeding due to traumatic injuries, with or without Blood Stasis, and for swelling and pain, it is ground into a fine powder and used orally or externally, alone or with Crinis Carbonisatus Hominis (Xue Yu Tan) and Rhizoma Ligustici Chuanxiong (Chuan Xiong). 5. Used in the treatment of angina pectoris in coronary heart disease. 6. For bleeding accompanied with dryness of the mouth due to Yin Deficiency, it is used with herbs that nourish Yin and remove Excess Heat from the Blood. Dosage: 3-10 g, if decocted in water for an oral dose; 1–1.5 g, if ground into powder for an oral dose. Appropriate quantity for external application.